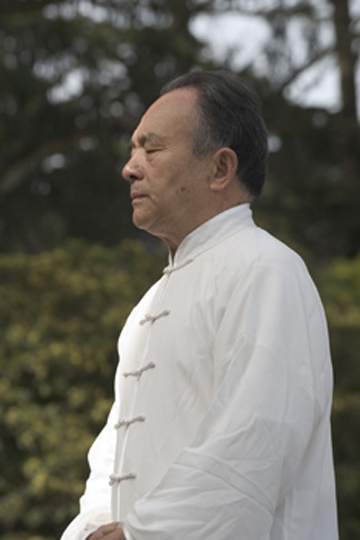 Master Zhang Xuexin, in Wuji Zhan Zhuang "Standing Post" meditation, the foundation of Hunyuan Tai Chi internal energy practice. Golden Gate Park, San Francisco, 2005. Master Zhang Xuexin is the senior disciple of Grandmaster Feng Zhiqiang, the founder of Hunyuan Tai Chi, and one of the top Chen Style Hunyuan Tai Chi experts in the United States. He began studying waijia (external martial arts) in China at age nine, especially Shaolin and Shuai Jiao (Chinese wrestling). In 1963, at age 35, he began his study of neijia (internal martial arts), with both the laojia (old) and xinjia (new) forms of Chen Style Tai Chi, working with masters like Li Ruiyuan, Rui Mongni, and Chen Zhaokui (eldest son of Chen Fake). In 1970, he settled in Beijing and began studying with Feng Zhiqiang, becoming his top senior indoor student. In 1990, Master Zhang relocated to San Francisco in the United States. Master Zhang's two major influences in his Tai Chi studies were masters Chen Zhaokui and Feng Zhiqiang. Chen Zhaokui emphasized qinna (joint-locking and grappling techniques) and chansigong (silk-reeling), while Feng's training focused on neigong (internal power), tuishou (push-hands), and sparring. Master Zhang was certified by the Chen Style Taijiquan Association, and taught Tai Chi in China for over ten years before relocating to the United States. He currently lives in San Francisco, and continues to teach his personal disciples, although he has retired from public teaching. His school, the Feng Zhiqiang Taiji Academy USA, has been instrumental in establishing Hunyuan Tai Chi in the United States, and in developing the next generation of Hunyuan Tai Chi disciples and teachers.